Believed to be the earliest, and most complete surviving tarot deck. It was commissioned by the Visconti family who were the Dukes of Milan in the 1450's. These cards are universally recognized as one of the most extraordinary examples of miniature art and Renaissance symbolism. They have been restored and printed with gold foil to enhance its original splendor. Contrary to popular belief, tarot cards were used for games long before they were used for fortune telling. They were the ancestors to modern trump, or trick-taking games. 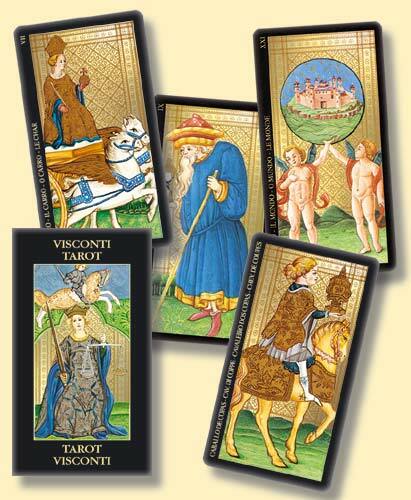 We also include our booklet with a short history of Tarot cards, and six of the earliest surviving Tarot games. The authors, experts in the fields of art history, games, and the tarot, trace the history of the tarot deck from its origins in the game room to its current role in occult circles. 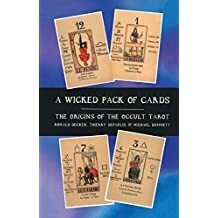 Their thorough research cuts through the misconceptions and glamorization surrounding the cards' rather mundane beginnings, while revealing the rich history of psychological, political, and religious influences on our perceptions of what is now a common tool of many occult practitioners.